Target Field lives up to the hype. 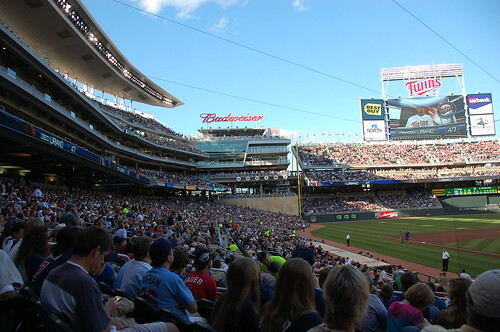 There’s a feeling I’ve picked up since the new home of the Minnesota Twins opened: people don’t want it to be as good as everyone says it is, as though there’s no way Minnesota could have a world-class ballpark that could equal those in larger (read: better) cities. Well, the news is that it absolutely does. It’s spacious, it’s comfortable, it’s nestled into downtown but convenient to get to, it’s distinctive yet welcoming and comfortable. I didn’t want to hate it but I wanted to be absolutely fair in my consideration of it. 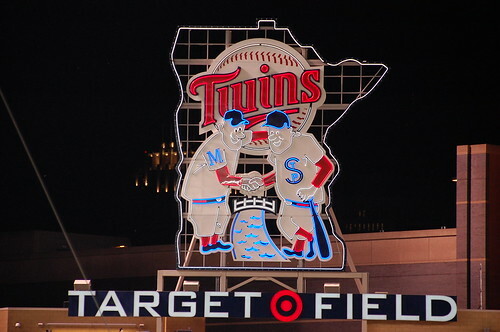 It’d be awfully hard to not love Target Field. The park is located on the edge of downtown, just across the plaza from the Target Center arena, with bars and restaurants in comfortable walking distance. There’s tons of parking, there’s light rail, and there are even rail lines to the distant suburbs tucked underneath the ballpark. I liked the modern architecture and clean lines; I didn’t feel that anything was jarring or out of place. And I particularly loved that the quirks of the layout were due to actual physical constraints, much like ballparks used to be – they maximized the space by building over the highway and the train tracks, but still had to deal with actual limitations. 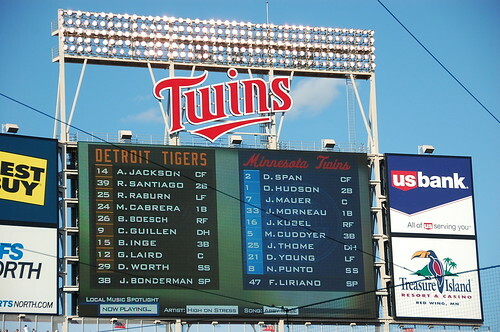 The video board is the 4th largest in MLB. It’s a good board, and overall, it’s easy to find the information you need. I especially appreciated that the lineups for both teams were posted along the ribbon boards from the minute the gate opened, while the other boards were used for promotions and entertainment. 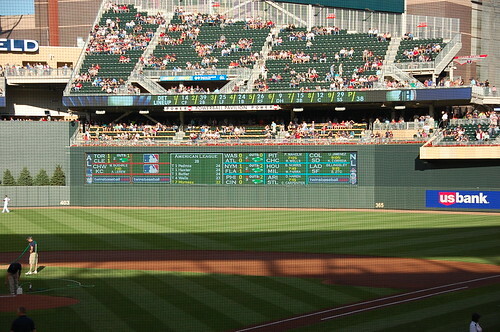 I hate the out of town scoreboard being part of the outfield wall, but at least the Twins never took it down, even between innings. 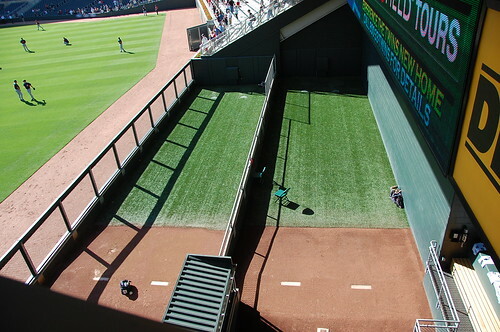 The bullpens are side by side out in left field. You have to be in the seats adjacent to actually see the pitchers, but I liked the setup. There are four entrance gates, each named after one of the retired numbers. 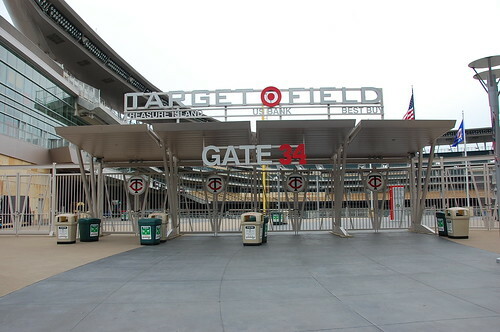 At Target Field, the showcase gate is Gate 34 (for Kirby Puckett), which is the centerfield gate and not the home plate gate; it’s the gate that faces onto Target Plaza and the city. It’s lined with plaques and statues and box offices, a kinetic arts sculpture obscuring an otherwise ugly parking garage, and 9 soon-to-be-topiaries (for now just forms) that are illuminated as the game progresses to indicate the current inning to anyone driving or walking by. 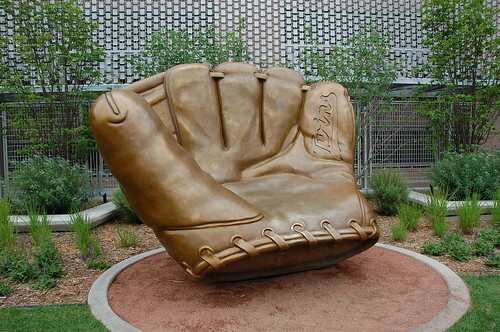 It’s also the location of the giant glove you may have seen in photographs; it’s located exactly 520 feet from home plate to commemorate the distance of Harmon Killebrew’s longest home run in Twins history. You can do a full 360 on the field level without any obstructions – except that the park is so popular and the experience of being able to watch the game while standing behind the section with a beer in your hand is so novel that the view is blocked by fans standing and enjoying the game. The Twins recently started selling standing room tickets because they were noticing that people were buying the cheapest seats in the building but never sitting in them, opting instead to go find a place to stand on the field level or in the Captain Morgan bar in the left field corner, or even just to enjoy the novelty of still being part of the game while walking to get a beer or a snack. 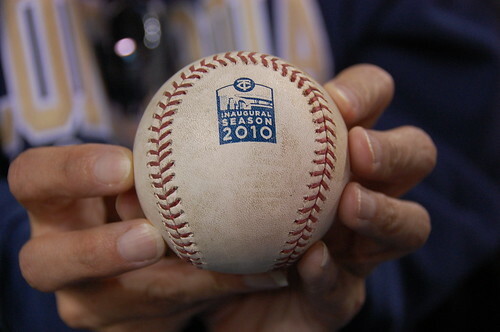 The signature accent in the ballpark is the local granite you have seen in the backstop on tv; the top of the dugouts and various corners of the ballpark are faced with it as well. I wasn’t sure how I felt about it until the sun went down a little more and the sun hit the top of one of the dugouts and the stone glowed as if lit from behind. Brick is warm and lovely, but doesn’t do that. Beer. Target Field has 13 keg rooms to service its patrons; as a point of comparison, Citi Field, my home park, only has 4. There are multiple pubs and bars and places to just hang out and enjoy baseball. They are all crowded not long after the gates open. Food. They went regional and local, so you can enjoy multiple sausage types, fried cheese curds in a canoe, as well as the traditional hot dogs and hamburgers. Kramarczuk’s sausages are worth a stop; I also enjoyed the Murray’s Steak Sandwich (home of the famous ‘you can cut it with a spoon’ steak from the restaurant of the same name, located steps away from the ballpark). But the oddest, most delicious thing I had at Target Field was the Wild Rice Soup from Lunds & Byerly’s. I was actually looking for the fried cheese curds when I stumbled on the soup and decided that the day was just cool enough for me to try it. It was unusual and delicious and incredibly filling, and I can imagine that eating it on a cold April day would be just sublime. Speaking of cold, I was not one of those “ohmygod why didn’t they build a roof” people in regards to this ballpark. People watch sports in cold weather all the time; I figured that people in Minnesota, who are not big babies when it comes to cold, could manage just fine. And they did try to offer some comfort against the cold – there are radiant heaters in the ceilings all over the concourses, as well as an actual FIRE PIT up on the Budweiser deck. I could not imagine a fireplace at a ballpark in, say, Philadelphia, where I could see the fans would crumble cotton candy cores into torches and light the place on fire after a particularly bad loss. It is odd, and unusual, but it is also very Minnesota. The other oddity, at least to me, is that the park does not open up early, for BP or anything else. Gates open at 5:30. That’s not a lot of time to enjoy your brand new ballpark. The longer the park is open, the more you can make from concessions, the more people will have a soda (or rather “pop”) or another beer or yet another snack. And it would give people time to explore. I don’t know why it’s like that, but it just struck me as odd. 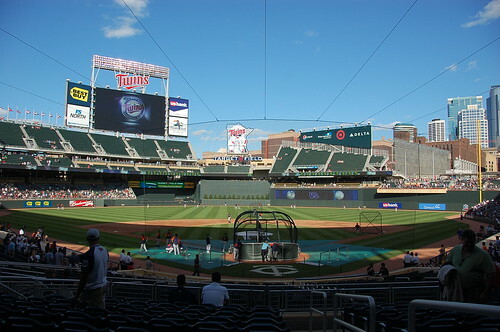 Fan IQ: Here’s a photo of the ballpark at a game on a Monday night. It was full and it stayed full. 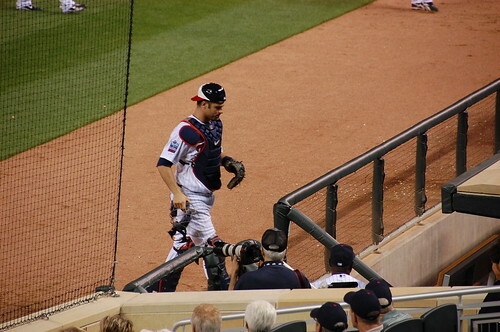 No one left early, despite the drubbing the Twins took from the Tigers. (It was that horrible night when Joel Zumaya injured his elbow.) It was loud and it was attentive; there was no need for the scoreboard to tell people to clap at two strikes, and the “GET LOUD” was almost an afterthought, the crowd was already loud. The OOHs and AAHs were loud and united – people were watching what was going on on the field. People in Minnesota are scary nice, but they did boo appropriately. There wasn’t a lot of up and down in the middle of the inning, and people did deliberately hunch down or sit on the stairs until the at-bat was over if it was unavoidable. Her daughters were a lot more interested in the ball once they realized that Joe Mauer certainly touched it. The last thing I will write about Target Field is the one that is the most exceptional to me: the music. It is chosen with care to appeal to everyone; it doesn’t just pander to the top 40 or the young or the hits of the day. It will stand out to those who are paying attention and simply be nice background to everyone else. The song in the stretch is “Funkytown,” which might seem odd and random unless you know that Lipps Inc. were from Minneapolis, were part of the music explosion in the 80s that brought you Prince and the Time as well as the Replacements and Husker Du, and wrote the song about the city. Of course, you still have the ‘TEXT VOTE FOR YOUR FAVORITE SONG’ and other sponsored activities that you can’t do much about. But I will probably never have a more perfect, more personally meaningful Minneapolis moment than the one I had sitting 20 rows from home plate on a beautiful day, the field and city skyline in front of me, with “Unsatisfied” by the Replacements, the quintessential hometown heroes, coming out of the PA. It is my favorite song, it is one of their best songs, it was breathtaking and unexpected and utterly perfect. However, I feel a strong need to question them for the use of “Long Walk Home” by Bruce Springsteen at the end of the game. “Long Walk Home” is an anti-war song; it’s not a happy song, and while it certainly is wistful, it’s not “awww our team just lost the ballgame” wistful. Maybe I’m wrong and they know what the song is about and they’re being subversive, but it’s as bad as someone using R.E.M.’s “The One I Love” at their wedding. 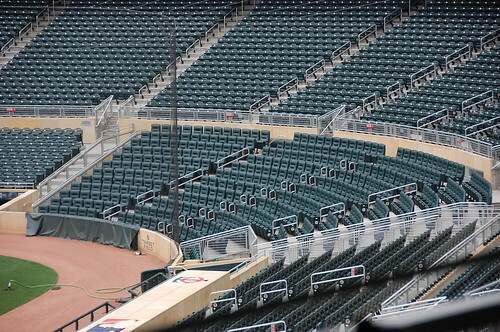 2010 is going to be a tough year to find a good, reasonably priced seat at Target Field. I’d suggest going for standing room and grabbing a spot in the right field corner. 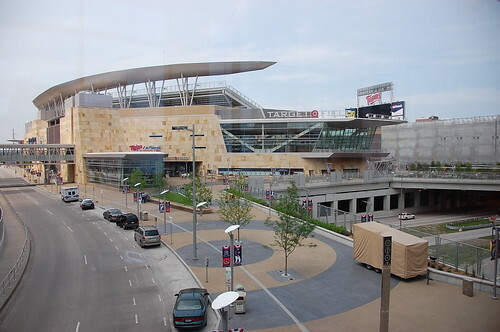 We stayed at a hotel near the Metrodome because we got a good deal, and took light rail to the game, but walked back, which took about 20 minutes. We had been warned that the light rail after the game was a nightmare, so figured that it would take us longer to wait for a train and get on it than it would to just walk. 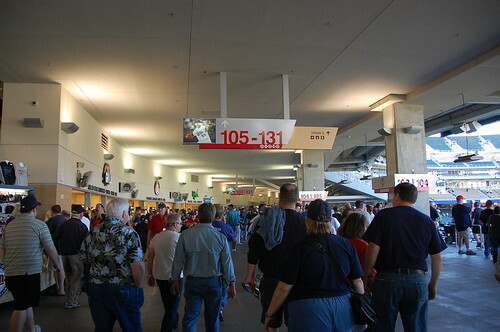 Plenty of other people were walking, most of whom were heading to outlying parking garages that advertised cheap parking for ballgames, and also provided easier access and less traffic than the official “ramps” (what they call parking garages in MN) across from the ballpark. The tours are 100% worth it, but buy in advance since they’re in demand. 90 minutes, visiting clubhouse and dugout access, you visit all of the levels and clubs. We didn’t get to the Champions’ Club on our tour because it had flooded, but that was the only disappointment. The guide was thoughtful and knowledgeable. He answered every question I had before I even had a chance to ask it. 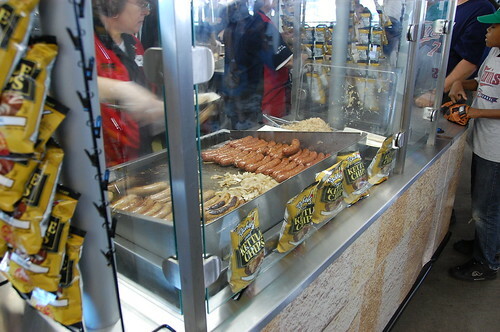 They hand out food maps at all the concessions, in case you’re looking for something and can’t find it. Your best chance to see the mascot, TC Bear, is to hightail it to the flag plaza during “Funkytown”. He sings “Take Me Out To The Ballgame” from there, and will pose for photographs for a limited period of time. There will be lines to get into the park since they don’t open early. You may want to choose a different gate if the gate you arrive at is crowded. Nice write-up, Caryn. I really enjoyed the park when I visited a few weeks back. I remember the interesting music choices. Some of the more curious songs: “Love Gun,” by Kiss (I think this was played after the Twins scored a run at some point), “Clock Strikes Ten,” by Cheap Trick (may have been after the 10th run the Twins scored), and “Rock Lobster” between innings. The New Jersey Nets (at least used to) play “Long Walk Home” after losses. I didn’t have much of a problem with it. I can’t wait to get out to MPLS myself! Just because the Nets have “New Jersey” in their name do not give them some kind of automatic pass to misuse Springsteen songs either. That misuse is as bad as Reagan misappropriating ‘Born In The USA’. When I was there over Memorial Day Weekend, I thought that the seating areas and the concourses were more crowded than in most parks. What did you think about that? Sharon, I did think that the concourses were a little crowded, but attributed that to sheer volume, park newness, and the fact that Minnesotans don’t walk like New Yorkers do. Yankee Stadium on a Saturday is just as crowded, Citi felt that crowded the first year. Does that make sense? Great review but as a local, I should correct you on a couple of little things. First, the main Gate 34 is in rightfield, not center. The “local granite” is actually limestone, from Kasota, MN specifically, about 75 minutes south of Twin Cities. And the Murray’s Steak sandwich is from the famous Murray’s “you can cut it with a butter knife” restaurant, not spoon. As for light rail after the game, it’s actually pretty organized and efficient. You can be on the train heading out in short order. However, the train creeps slowly through downtown before hitting max speed. If you’re at a hotel in downtown it probably is faster to walk. I was told by a season ticket holder to avoid light rail after the games, so I’m confident in the information provided. These are the types of corrections I wish people would email, but hey, if it makes you feel good to do it in a comment, why not. Sorry, I meant no offense on the little corrections in the comments, I didn’t see an obvious place where you’re email was located. So um no, it doesn’t make me “feel good” to do it in comments. I wasn’t trying to be a jerk about it. Also, I’ve been to six games this year and taken light rail for every one. The only game it was bad for was a mid-week day game when they don’t alter the normal schedule, otherwise, I’ve gotten on the train in less then ten minutes after getting into the line. Thank you so much for visiting. So sorry we missed you. 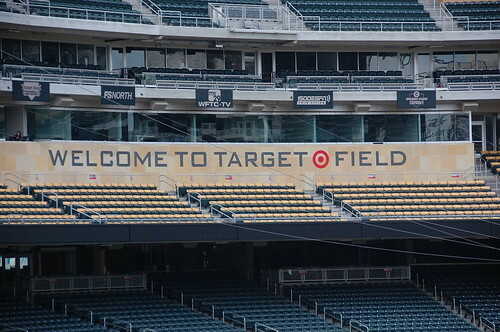 I was proud of Target Field before your amazing article. Now I’m practically glowing! Come back anytime. Caryn – the theory makes sense, but I felt a bit cramped there even allowing for those factors. 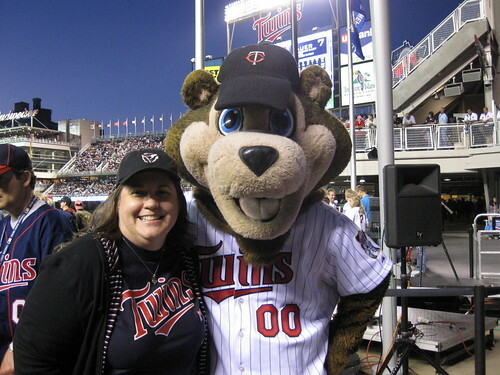 Hi Caryn, Im a sheet metal worker who worked on Target Field, and Im glad you liked it, makes me proud. The “scary nice” thing is misleading though, we’re really not that nice.